Shokansai (1919-2004) was born Shigetoshi ���N, the second son of Iizuka Rokansai. He graduated from the Tokyo University of Art having majored in oil painting (taking classes with Fujishima Takeji). After he came back from World War II, Shokansai gave up on the idea of becoming a painter after the death of his elder brother Mikio. 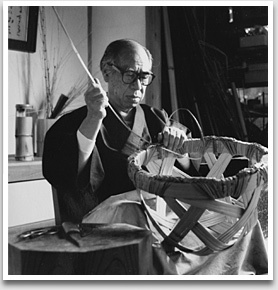 At that time he started to study bamboo basketry under his father, Rokansai, who was a strict teacher. In 1948, he received a prize at Nitten exhibition as a first time exhibitor and after that, he exhibited his works at Nitten twenty more times. Focussing on the concepts of "Point, Line, and Aspect," early on Shokansai created various new style bamboo baskets using different materials such as wall surface decoration, lighting equipments, metals, and acrylic. However, he gradually came face to face with "the inevitability of bamboo" and its "craft nature", and after taking an absence of formal exhibition for four years, he was admitted to the Japan Traditional Craft Arts Exhibition and received the Minister of Education Award in 1974. Thereafter, Shokansai assumed significant responsibility in the Wood & Bamboo section of the Japanese Craft Association for the next 29 years. Shokansai visited western countries, doing demonstrations of how to make bamboo baskets, and was an early activist in raising the profile of Japanese bamboo art abroad. From 1979 to 1981, by Imperial Household Agency commission, Shokansai engaged in a survey of bamboo works housed in the Shoso-In. The chance to do this investigation allowed him to discover the true value of bamboo to him. In 1982, when he was 63 years old, Shokansai was designated a Living National Treasure - the second bamboo artist to be so honored, following Shono Shounsai from Kyushu who was the first. He respected dignity and magnificence in his works, and like Rokansai, Shokansai also adopted the concept of three states of Shin (�^), Gyou (�s), and Sou (��). He continued to add to Rokansai's efforts in bamboo embroidered plaiting (�h�� Sashiami), earning prizes for his work. Using several other techniques such as bundled plaiting (���� tabaneami), irregular 'cracked ice' plaiting (�X��� Hyoretsuami), he raised "bamboo craft" to the acme of the expression of Japanese traditional beauty.